Model ships for naval games in 15mm are easy and inexpensive to make. A pair of ships can easily be knocked out in a single evening. Included here are all the instructions you will need to build a fleet of your own. My galleys' hulls are made of quarter inch thick balsa wood and matte board or foam core, and are about 7 inches in length and 1.75 inches across the beam. 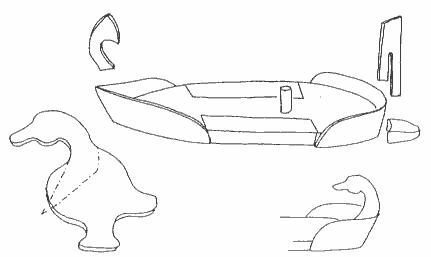 Included in this section are plans for both a "Greek" and "Roman" style ship. But don't let these labels restrict your creativity. Experiment with the designs, switch them around. Make ships that look good to you. Enlarge the Galleys for later period ships, or in case they just look better if made bigger. I recommend printing out the plans and using a photocopier to resize them if neccesary. I would then cut out the individual elements and use them for a pattern. 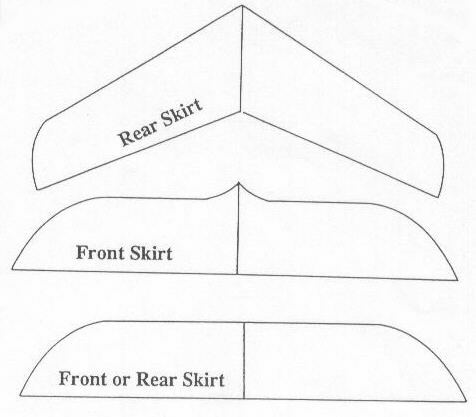 The sections marked "Front and/or Rear Skirt" are the sections of railing that are fastened to the front or rear of the ship. 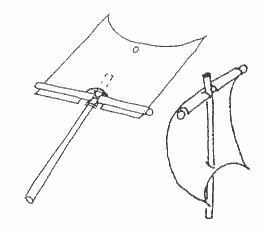 Cut these out in plain paper first and fold them around the bow or stern of the ship so that you get an idea of how they work. Once you understand the principal, cut them out again, this time from cardboard or matte board and glue them into place. Next you will need some fancy bow and stern posts. I use one eighth inch balsa wood because it is so easy to cut, but you can use whatever you like. There is a crafts shop near where I work and sometimes I'll drop over and check out their crafts supplies. Little dowelling pegs make great bow posts. Lately I've found a bunch of small, flat, wooden ducks. I've cut their heads off and they make great stern posts for my Roman ships. Be creative. There are thousands of possibilities. The final stage is to drill a hole through the deck to attach the mast. Once the hole is drilled I insert a short piece of plastic drinking straw, plug the bottom so the mast won't go all the way through, and glue it into place. When all the glue is dry, paint your ship and your hull is complete. 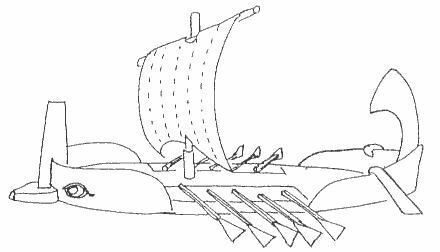 For obvious reasons the oarsmen are not included in the ships, but removable oar sections, five to a side, made out of toothpicks and card stock, are used to represent the rowers. To make the oars I use square toothpicks and cut off one end. I then make little wedges of card stock and glue these to the remaining ends. When they are dry I paint them brown and the oars are finished. The "Oar Wells" are the same level as the deck, but painted black. I cover these oar well sections of the ships with "invisible" double-stick tape and just stick the oars to the ships. These oars can then be removed to simulate damage as can the rudders which are hooked over the gunwales at the stern. The sails on my ships are mounted on masts and yards made of thin wooden sticks. I use wooden shish-kabob skewer sticks and card stock sails. First I decorate the sails. Vertical stripes are easy and colorful. If you feel artistic try adding an eagle, or dragon, or other animal design. Almost anything is appropriate. I then glue the sail to the mast upside down as shown here. When this has dried, I then pull the sail down around the mast and glue the bottom in place. This gives the sail that billowed appearance. All you need now is a crew and your ship is ready for battle. 15mm ancient figures are available from dozens of sources. Ask your local hobby shop to order some for you. Mount the figures on bases so they won't be falling over all the time, paint them, and you're done. I mount my figures on the ½" square cardboard counters left over from some of my old bard games. Small metal washers would work well - you can use whatever you like. 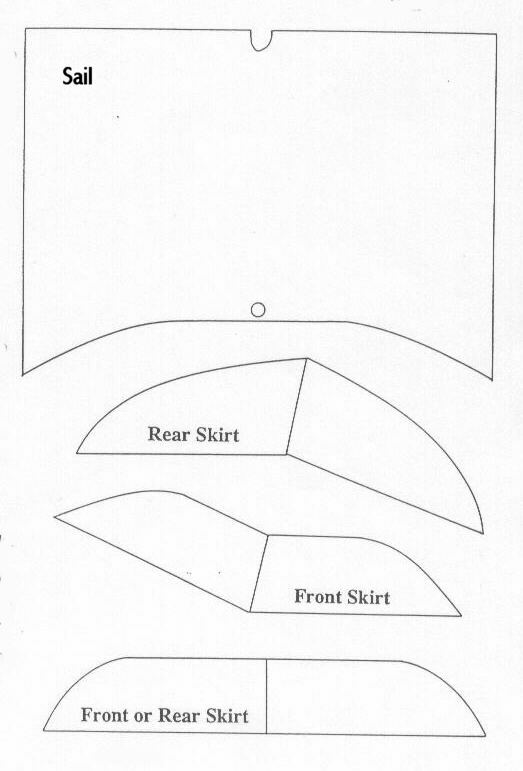 In case these templates do not print at the correct size, the galley hull is about 7 inches in length and 1.75 inches across the beam. The sail is 4.75 inches across and 3.5 inches high at the outer edge. Thank you for visiting The Jackson Gamers' pages at Angelfire. Please come back and visit again!